Dinghy and catamaran sailors of all types are cordially invited to compete in the 7th Annual Connecticut River Dinghy Distance Race on Saturday, May 6, 2017. This popular event is open to any boat with a Portsmouth Yardstick rating and it’s estimated that at least 30 different one-design classes have participated since its inception. 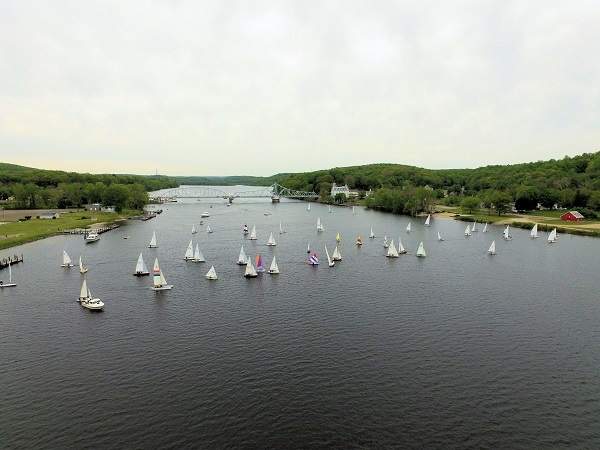 Conceived as an adventurous alternative to traditional windward-leeward courses by Dan Rennie of Hamburg Cove, CT, an active local sailor, the Connecticut River Dinghy Distance Race has grown steadily since the first one in 2011. There’s always a strong turnout of Lasers, Force 5s and Sunfish, JY15s, MC Scows, although it’s not unusual to see a truly diverse array of boats being rigged on the lawn at Eagle Landing State Park in Haddam, CT – everything from Nutshell Prams, Flying Scots, Scorpions, Larks, Buccaneers, Cape Cod Geminis,Melges 17s 470s, Contenders, 5O5s and International Canoes to cats including Hobie 16s, 17s and Miracle 20s, Nacra 5.7s, and even a Tornado. The course of approximately 10 miles takes racers from Eagle Landing State Park downstream to Calves Island just north of the Baldwin Bridge in Old Saybrook, and back upstream to a finish line south of Brockway Island outside of Hamburg Cove. The party and awards ceremony will follow at Pettipaug Yacht Club in Essex. 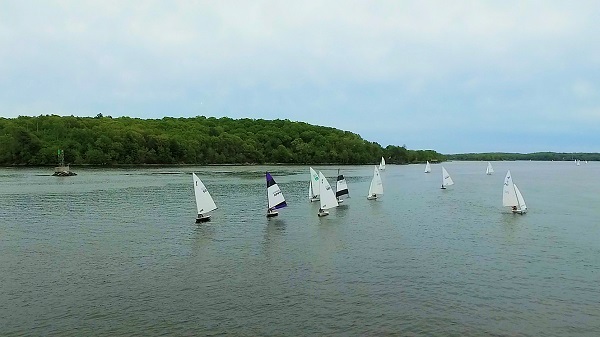 Competitors meet and launch their boats at Eagle Landing in the morning, bring their trailers and cars to Pettipaug Yacht Club and get shuttled back up to their boats. The start time is noon, just south of the Goodspeed Bridge. This is a winner-take-all race, with the top three overall finishers claiming trophies in single-handed, crewed, and multihull divisions. If more than five boats in a class register, they’ll compete in their own one-design class with individual trophies awards well. Past years have seen a wide range of participants (50 boats in 2016), from novices to Olympians and America’s Cup vets, along with collegiate racers and families enjoying a day sail. For more information, contact Rennie at danrenniect@gmail.com.